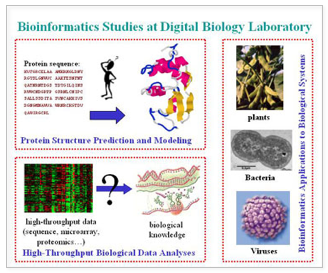 The research focus of Digital Biology Laboratory (DBL) is Bioinformatics and Computational Biology. We are interested in various topics including protein structure prediction, high-throughput biological data analyses, computational proteomics, and in silico studies of plant and microbes. Protein Structure Prediction and Modeling: We are interested in developing effective computational methods for protein structure prediction and modeling. Our research in this area includes protein structure comparison, protein secondary structure prediction, protein fold recognition (threading), mini-threading, NMR protein structure determination, and structure-based function prediction. High-throughput Biological Data Analyses: We are interested in developing novel computational techniques for analyzing large-scale biological data, including genomic sequence, gene expression, protein-protein interaction, sub-cellular localization, and phenotypic data. The analyses are used for experimental design (e.g. microarray primer design) and predictions of gene function and biological pathway. Computational Proteomics: We are interested in developing new computational methods for protein identification through analyzing mass spectrometry data, including mass fingerprinting and MS/MS data. Application of Bioinformatics Methods in Biological Systems: We are interested in applying various computational methods/tools and available experimental data to study the evolution, protein structure and function, gene regulation and biological pathway through collaboration with experimentalists. Our main target systems are plants (especially Arabidopsis and soybean), bacteria (especially Rhizobium and Synechococcus), viruses (especially SARS and flu virus), and yeast (Saccharomyces cerevisia). Liang Y, Zhang F, Wang J, Joshi T, Wang Y, Xu D. Prediction of Drought-Resistant genes in Arabidopsis thaliana using SVM-RFE. PLoS ONE 2011;6 (7), art. no. e21750. Wang Z, Zhang XC, Le MH, Xu D, Stacey G, Cheng J. A protein domain Co-occurrence network approach for predicting protein function and inferring species phylogeny. PLoS ONE 2011;6 (3), art. no. e17906. Gao J, Xu D. The Musite open-source framework for phosphorylation-site prediction. BMC Bioinformatics 2010;11 (SUPPL. 12), art. no. S9. Zhang C, Xu S, Xu D. Detection and application of CagA sequence markers for assessing risk factor of gastric cancer caused by Helicobacter pylori. Proceedings - 2010 IEEE International Conference on Bioinformatics and Biomedicine, BIBM 2010, art. no. 5706614, pp. 485-488. Xu S, Zhang C, Miao Y, Gao J, Xu D. Effector prediction in host-pathogen interaction based on a Markov model of a ubiquitous EPIYA motif. BMC Genomics 2010;11 (SUPPL. 3), art. no. S1. 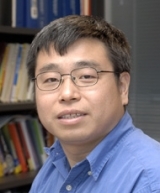 Wang Q, Shang Y, Xu D. Protein structure selection based on consensus. 2010 IEEE World Congress on Computational Intelligence, WCCI 2010 - 2010 IEEE Congress on Evolutionary Computation, CEC 2010, art. no. 5585949. Gao J, Thelen JJ, Dunker AK, Xu D. Musite, a tool for global prediction of general and kinase-specific phosphorylation sites. Molecular and Cellular Proteomics 2010;9(12):2586-2600. Joshi T, Yao Q, Franklin LD, Brechenmacher L, Valliyodan B, Stacey G, Nguyen H, Xu D. SoyMetDB: The Soybean Metabolome Database. Proceedings - 2010 IEEE International Conference on Bioinformatics and Biomedicine, BIBM 2010, art. no. 5706563, pp. 203-208. Yang JY, Niemierko A, Bajcsy R, Xu D, Athey BD, Zhang A, Ersoy OK, Li GZ, Borodovsky M, Zhang JC, Arabnia HR, Deng Y, Dunker AK, Liu Y, Ghafoor A. 2K09 and thereafter: The coming era of integrative bioinformatics, systems biology and intelligent computing for functional genomics and personalized medicine research. BMC Genomics 2010;11 (SUPPL. 3), art. no. I1, . Guttikonda SK, Trupti J, Bisht NC, Chen H, An YQC, Pandey S, Xu D, Yu O. Whole genome co-expression analysis of soybean cytochrome P450 genes identifies nodulation-specific P450 monooxygenases. BMC Plant Biology 2010;10, art. no. 243. Libault M, Brechenmacher L, Cheng J, Xu D, Stacey G. Root hair systems biology. Trends in Plant Science 2010;15(11):641-650. Srivastava GP, Li P, Liu J, Xu D. Identification of transcription factor's targets using tissue-specific transcriptomic data in Arabidopsis thaliana. BMC Systems Biology 2010;4 (SUPPL. 2), art. no. 2, . Wu X, Ren C, Joshi T, Vuong T, Xu D, Nguyen HT. SNP discovery by high-throughput sequencing in soybean. BMC Genomics 2010;11(1), art. no. 469. Libault, M., Farmer, A., Joshi, T., Takahashi, K., Langley RJ, Franklin LD, He J, Xu D, May G, Stacey G. An integrated transcriptome atlas of the crop model Glycine max, and its use in comparative analyses in plants. Plant Journal 2010;63(1):86-99. Srivastava GP, Qiu J, Xu D. Genome-wide functional annotation by integrating multiple microarray datasets using meta-analysis. International Journal of Data Mining and Bioinformatics 2010;4(4):357-376. Shyu CR, Pang B, Chi PH, Zhao N, Korkin D, Xu D. ProteinDBS v2.0: A web server for global and local protein structure search. Nucleic Acids Research 2010;38 (SUPPL. 2), art. no. gkq522:W53-W58. Zhao D, Wang Y, Luo D, Shi X, Wang L, Xu D, Yu J, Liang Y. PMirP: A pre-microRNA prediction method based on structure-sequence hybrid features. Artificial Intelligence in Medicine 2010;49(2):127-132. Zhang J, Wang Q, Barz B, He Z, Kosztin L, Shang Y, Xu D. MUFOLD: A new solution for protein 3D structure prediction. Proteins: Structure, Function and Bioformatics 2010;78(5):1137-1152. Hajduch M, Hearne LB, Miernyk JA, Casteel JE, Joshi T, Agrawal GK, Song Z, Zhou M, Xu D and Thelen JJ. Systems analysis of seed filling in Arabidopsis: Using general linear modeling to assess concordance of transcript and protein expression. Plant Physiology 2010;152(4):2078-2087. Joshi T, Yan Z, Libault M, Jeong DH, Park S, Green PJ, Sherrier DJ, Farmer A, May G, Meyers BC, Xu D and Stacey G. Prediction of novel miRNAs and associated target genes in Glycine max. BMC Bioinformatics 2010;11(SUPPLL.1):art. no. S14. Libault M, Brechenmacher L, Cheng J, Xu D and Stacey G. Root hair systems biology. Trends in Plant Science 2010;15(11):641-650. Libault M, Farmer A, Joshi T, Takahashi K, Langley RJ, Franklin LD, He J, Xu D, May G and Stacey G. An integrated transcriptome atlas of the crop model Glycine max, and its use in comparative analyses in plants. Plant Journal 2010;63(1):86-99. Lin GN, Wang Z, Xu D and Cheng J. SeqRate: Sequence-based protein folding type classification and rates prediction. BMC Bioinformatics 2010;11(SUPPL. 3):art. no. S1. Shyu CR, Pang B, Chi PH, Zhao N, Korkin D and Xu D. ProteinDBS v2.0: A web server for global and local protein structure search. Nucleic Acids Research 2010;38(SUPPL. 2):W53-W58. Song Z, Chen L and Xu D. Bioinformatics methods for protein identification using Peptide mass fingerprinting. Methods in Molecular Biology (Clifton, N.J.) 2010;604:7-22. Srivastava GP, Li P, Liu J and Xu D. Identification of transcription factor's targets using tissue-specific transcriptomic data in Arabidopsis thaliana. BMC Systems Biology 2010;4(SUPPL. 2):art. no. 2. Srivastava GP, Qiu J and Xu D. Genome-wide functional annotation by integrating multiple microarray datasets using meta-analysis. International Journal of Data Mining and Bioinformatics 2010;4(4):357-376. Wang Z, Libault M, Joshi T, Valliyodan B, Nguyen H, Xu D, Stacey G and Cheng J. (2010). SoyDB: A knowledge database of soybean transcription factors. BMC Plant Biology (in press). Wu X, Ren C, Joshi T, Vuong T, Xu D and Nguyen HT. SNP discovery by high-throughput sequencing in soybean. BMC Genomics 2010;11(1):art. no. 469. Zhang J, Wang Q, Barz B, He Z, Kosztin L, Shang Y and Xu D. MUFOLD: A new solution for protein 3D structure prediction. Proteins: Structure, Function and Bioformatics 2010;78(5):1137-1152. Zhao D, Wang Y, Luo D, Shi X, Wang L, Xu D, Yu J and Liang Y. PMirP: A pre-microRNA prediction method based on structure-sequence hybrid features. Artificial Intelligence in Medicine 2010;49(2):127-132. Zhang J, Xu D, Gao W, Lin G, He S. Isotope pattern vector based tandem mass spectral data calibration for improved peptide and protein identification. Rapid Communications in Mass Spectrometry 2009;23(21):3448-3456. Libault M, Joshi T, Takahashi K, Hurley-Sommer A, Puricelli K, Blake S, Finger RE, Taylor CG, Xu D, Nguyen HT, Stacey G. Legume transcription factor genes: What makes legumes so special? Plant Physiology 2009;151(3):1207-1220. Libault M, Joshi T, Benedito VA, Xu D, Udvardi MK, Stacey G. Legume transcription factor genes: What makes legumes so special? Plant Physiology 2009;151(3):991-1001. Gao J, Agrawal GK, Thelen JJ, Obradovic Z, Dunker AK, Xu D. A new machine learning approach for protein phosphorylation site prediction in plants. Lecture Notes in Computer Science 2009;5462 LNBI: 18-29. Kristen H. Taylor, Robin S. Kramer, J. Wade Davis, Dong Xu, Charles W. Caldwell, and Huidong Shi. Ultra-Deep Bisulfite Sequencing Analysis of DNA Methylation Patterns in Multiple Gene Promoters by 454-Sequencing. Cancer Research. In press. Trupti Joshi and Dong Xu. Quantitative Assessment for Relationship between Sequence Similarity and Function Similarity. BMC Genomics. BMC Genomics 2007;8:222, doi:10.1186/1471-2164-8-222. Robin Kramer and Dong Xu. Projecting Gene Expression Trajectories through Inducing Differential Equations from Microarray Time Series Experiments. Journal of VLSI Signal Processing Systems. In press. Rajesh Kumar, Jing Qiu, Trupti Joshi, Babu Valliyodan, Dong Xu, Henry T. Nguyen. Single Feature Polymorphism Discovery in Rice. PLoS ONE 2007;2(3): e284. doi:10.1371/journal.pone.0000284. Predrag S Krstic, Jack C. Wells, Miguel Fuentes-Cabrera, Dong Xu, and James W. Lee. Toward electronic conductance characterization of DNA nucleotide bases. Solid State Phenomena 2007;Vols 121-123, pages 1387-1390. Zhao Song, Luonan Chen, Ashwin Ganapathy, Xiu-Feng Wan, Laurent Brechenmacher, Nengbing Tao, David Emerich, Gary Stacey, Dong Xu. Development and Assessment of Scoring Functions for Protein Identification Using Peptide Mass Fingerprinting Data. Electrophoresis 2007;28:864-870. Andrew Nunberg, Joseph A. Bedell, Mohammad A. Budiman, Robert W. Citek, Sandra W. Clifton, Lucinda Fulton, Deana Pape, Zheng Cai, Trupti Joshi, Henry Nguyen, Dong Xu and Gary Stacey. Survey sequencing of soybean elucidates the genome structure and composition. Functional Plant Biology. In Press. Yong Wang, Trupti Joshi, Xiang-Sun Zhang, Dong Xu, Luonan Chen. Inferring Gene Regulatory Networks from Multiple Microarray Datasets. Bioinformatics 2006; 22:2413-2420. Xiufeng Wan, Guohui Lin and Dong Xu. An Efficient Algorithm for Predicting RNA Local Secondary Structural Landscape in Genomes. Journal of Bioinformatics and Computational Biology 2006;4:1015-1031. Pin-Hao Chi, Chi-Ren Shyu, Dong Xu. A fast SCOP fold classification system using content-based E-Predict algorithm. BMC Bioinformatics 2006;7:362 (http://www.biomedcentral.com/1471-2105/7/362). Monir Shababi, Karuppaiah Palanichelvam, Anthony B. Cole, Dong Xu, Xiu-Feng Wan, and James E. Schoelz. The ribosomal shunt translation strategy of Cauliflower mosaic virus has evolved from ancient long terminal repeats. Journal of Virology 2006;80:3811-3822. Xiaomeng Wu, Xiu-Feng Wan, Gang Wu, Dong Xu, and Guohui Lin. Phylogenetic Analysis Using Complete Signature Information of Whole Genomes and Clustered Neighbor-Joining Method. International Journal of Bioinformatics Research and Applications 2006;2:219-248. Seung Yon Rhee, Julie Dickerson, and Dong Xu. Bioinformatics and Its Applications in Plant Biology. Annual Review of Plant Biology 2006;57:335-360. Xiu-Feng Wan, Jizhong Zhou, and Dong Xu. CodonO: a new informatics method measuring synonymous codon usage bias. International Journal of General Systems 2006;35:109-125. Xiu-Feng Wan and Dong Xu. Computational Methods for Remote Homolog Identification. Current Protein and Peptide Science 2005;6:527-546. Jinrong Wan, Michael Torres, Ashwin Ganapathy, Jay Thelen, Beverly B. DaGue, Brian Mooney, Dong Xu, and Gary Stacey. Proteomic analysis of soybean root hairs after infection by Bradyrhizobium japonicum. Mol. Plant-Microbe Int 2005;18:458-467. Trupti Joshi, Yu Chen, Nickolai Alexandrov, Dong Xu. Cellular Function Prediction and Biological Pathway Discovery in Arabidopsis thaliana Using Microarray Data. International Journal of Bioinformatics Research and Applications 2005;1:335-350. Jianjun Wen, Zhi-Zhong Chen, Romeo Rizzi, Dong Xu, Guohui Lin, Ying Xu, Tao Jiang. An improved approximation algorithm for 2-interval scheduling and NMR spectral peak assignment. Journal of Computational Biology 2005;12(2): 129-146. Xiu-Feng Wan, Tao Ren, Kai-Jian Luo, Ming Liao, Gui-Hong Zhang, Jin-Ding Chen, Wei-Sheng Cao, Ye Li, Ning-Yi Jin, Dong Xu and Chao-An Xin. Genetic characterization of H5N1 Avian Influenza Viruses isolated in Southern China during the 2003-04 avian influenza breakouts. Archives of Virology 2005; 150(6):1257-1266.